Jan 21, 2010 • Dean Stevenson has farmed the plains of south-central Idaho most of his forty-seven years. Like all farmers, he worries about things like the price of sugar beets and malt barley or the cost of gasoline, but most of all, he worries about water. Stevenson is part of a water district—the Magic Valley Ground Water—that helps manage water taken from the aquifer. In 2006, another irrigation district on the Snake River Plain, A&B, believed that some of the farms in its district had run short on water, resulting in a poor harvest. 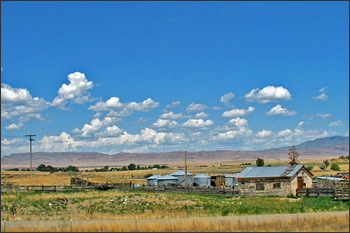 Because A&B has senior (older) water rights, Idaho law allowed them to issue a water call, a demand that junior water right holders, including Stevenson, draw less water from the aquifer. The challenge in refereeing water disputes, or managing a water supply in general, has always been figuring out how much water is actually being used. Most of us think of ‘water use’ as the water we are billed for every month. But for state water managers, ‘water use’ has a different meaning. Water is only used, or “spent,” when it is removed from the bank entirely, and that happens when it evaporates from the ground or is soaked up by growing plants and released (transpired) as water vapor during photosynthesis. A water meter, such as those on the wells that Dean Stevenson uses to pump irrigation water from the Snake River Plain aquifer, tracks how much water a user withdraws, but not how much is actually spent. To track farmers’ water spending, the Department of Water Resources needs to measure evapotranspiration (evaporation plus transpiration) across millions of acres of cropland. Previously, they estimated evapotranspiration for each county from temperature, humidity, wind speeds, and sunlight measured at regional weather stations. “Remote sensing was the only way to throw a rope around all the water consumption going on in Idaho,” says Rick Allen, a water resources engineer at the University of Idaho. With a grant from NASA in 2000, Allen and Morse began looking for ways to use data from the Landsat satellites to estimate evapotranspiration across the Snake River Plain and other farmland in Idaho. With the ability to see the ground in greater detail than many other science satellites, the Landsat satellites were NASA’s missions specifically designed to study the Earth’s land surface. Landsat sees 30 meters square in a single image pixel—the perfect resolution for monitoring individual fields of crops. Calculating the amount of energy used to heat the air posed a much bigger challenge. “That’s the lion we have to tame,” says Allen. The energy used to heat the air near the ground comes from the ground itself: it is the heat you feel rising from a parking lot or your car’s dashboard on a hot day. The transfer of energy between the ground and the air is driven by the temperature difference between them, something that changes as often as the land surface changes. It also depends on wind and the way it plays over Earth’s surface. “We cannot see wind [over land] from a satellite,” says Allen. “Twenty to twenty-five years ago, people at Goddard [Space Flight Center] and other places were working on this same problem. They were wanting to calculate evapotranspiration using surface energy balance using Landsat thermal data, and they concluded it could not be done,” says Allen. The problem, he explains, was that they were trying to be too precise. As good scientists, they wanted to calculate the heat transfer to the atmosphere directly using Landsat’s measurements of surface temperature along with ground measurements of the air temperature. 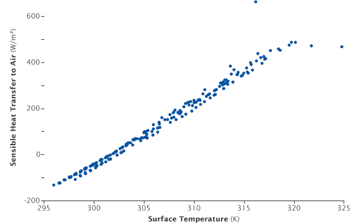 But there was just enough uncertainty in the air temperature and surface temperature measurements that they couldn’t calculate the heat transfer accurately.